As summer wanes and autumn approaches, that can only mean one thing! Football season is here! NCAA Football began just a few days ago and Week 1 of the NFL season officially begins September 8th when the Broncos host the Carolina Panthers in a rematch of last year’s Super Bowl! With the start of football season comes one of our most favorite activities: tailgating. Tailgating is an awesome opportunity to gorge on comfort food, bond with friends and family, and of course, root for the home team. But just like any activity, tailgating is the most fun when you are properly prepared. 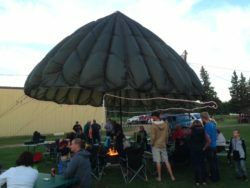 We’re biased because we live and breathe military surplus everyday, but you’d be surprised just how many of our items have great applications at a tailgate. We’ve put together a list of some of our military surplus items that make a great addition to any tailgating supplies checklist. First Aid Kits are one of those “better safe than sorry items” – it’s much better to have one and not need it than to need it and not have it! Tailgating is a pretty safe activity by and large, but activities often include things like cooking, which could lead to cuts or burns. Of course, this goes without saying, but the introduction of alcohol to any scenario seems to increase the likelihood of someone getting injured in one way or another. Even if your tailgate crew aren’t planning on consuming alcohol, odds are good that your tailgate neighbors will be partaking. We carry several first aid kits in our military surplus store, but the Platoon First Aid Kit offers a healthy mix of the basics, including latex gloves, pain relievers, instant ice packs, and many other essential first aid items. Best of all, it comes in a fairly small nylon pouch that won’t take up precious real estate in your vehicle, a precious commodity come tailgate season. You’ll need a source of heat such as a camp stove or even a small, modest fire if local regulations allow to use this griddle. For just $59.95 you’d be hard pressed to find a higher-quality all aluminum griddle. Made right here in the USA, this USGI aluminum griddle offers a 359 square inch cooking surface – plenty of room for burgers, dogs, eggs and any thing else you can imagine. Just having the right containers and utensils can make cooking on the pavement a lot more enjoyable. 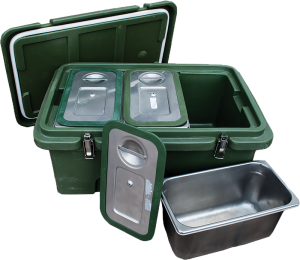 Plus when you roll up to the tailgate with a USGI Top Loading Food Pan Carrier (pictured right) you will look like a professional tailgater. This unit is ideal for holding, transporting and serving your favorite football-inspired culinary creations, and features molded-in handles for secure and easy transportation. The unit is very well insulated and secures well, making this the ideal way to transport large amounts of food that are prepped ahead of time. Our USGI Stainless Steel Pans are also a great addition to any tailgaters arsenal. One of our favorite things about working at Coleman’s is finding new uses for our military surplus items. Check out this USGI Stainless Steel Instrument Tray, which makes a great repurposed vegetable griller! Nothing is worst than showing up to a rainy tailgate session completely unprepared for precipitation. Don’t worry – we’ve got you covered – literally! The Italian Rubber Boots pictured to the right are offered at just $14.95 in unused condition, manufactured by reputable Italian company Superga®, who brings over 100 years of shoe making to the table. The best part of these water proof boots is their comfy cotton lining which makes it very easy to slip them on and off. If you’ve ever struggled to slip on a pair or rubber boots without this feature, you understand the struggle of rubber boots all to well. Thankfully, the cotton lining in these boots has completely eliminated that nuisance. Some other great rain protection products in our military surplus store include our popular French Rain Jacket and our Swedish Party Poncho 4-pack. The French Rain Jacket is perfect for tailgating because it’s waterproof, but lightweight, and big enough to allow other layers like your favorite NFL team’s hoodie underneath. As for the Swedish Party Poncho, while you may not be setting any fashion trends, at just under $20 for the four-pack, you will be dryer than all your friends without breaking the bank! This four-pack is a great deal, and even if you think you’ll never use them, they’re great to have with your tailgating supplies for those dreadful rainy Sundays come football season. These ponchos are a handy item to have in your car at all times, not just tailgate season. While the football season begins in beautiful late summer / early fall conditions, much of the football season takes place during the frigid winter months. Don’t fret – cold weather gear is Coleman’s bread and butter! We’ve got all the gloves, hats, jackets and other cold weather gear to keep your tailgate party rocking and rolling no matter how frigid it gets. Best of all, all of this quality cold weather gear is available at discount surplus prices. The US Military Issue Polartec® Cold Weather Jacket is an absolute bargain at just $59.95 and will keep you very warm. 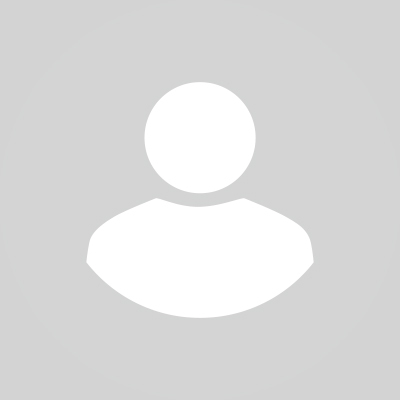 Check out the reviews for this product and you will see that it is an exceptionally warm jacket that is pretty much warm enough to be classified as a coat. The best part is, it’s big enough to allow for plenty of layers underneath. Other great cold weather items include our USGI Wool Balaclava and our Camouflage Fleece Blanket w/ Nylon Tote. This USGI Silk Weight Underwear Set also makes a great first layer for fall and winter. A mug or thermos is essential to keep cold liquids cold and hot liquids hot! The double walled Stainless Steel Mug pictured to the right will definitely turn heads. These are some seriously well-built mugs, available in two sizes – 150z or 33oz. One huge advantage about these stainless steel mugs, and stainless steel products in general, is that they are very easily cleaned and quite sanitary – you don’t have to worry about those gross coffee odors and stains your old plastic thermos has. 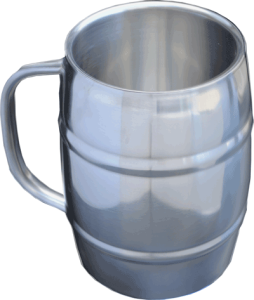 Our Swedish Military Stainless Steel Pitcher is the mother of all pitchers. This baby can hold up to a whopping 4 Liters (just over a gallon) of liquid. This is great for both cold and hot liquids. Use it to transport large amounts of beer from the keg into the cups of all your buddies and you will be beloved by all. One of our most popular products of late has been our Stainless Steel Vacuum Thermos Bottle, which is currently out of stock but coming back in stock in late October! Be sure to check back then, as this item is a very fast seller. We’ll do our best to keep it in stock, but you’ve been warned! Perhaps the beauty of football season is that we have to include both hot weather gear and cold weather gear on this list. For those early-season hot weather days, it’s very important to stay hydrated and avoid the sun to make sure you actually make it to game-time! Like we mentioned earlier, we love repurposing military surplus items! 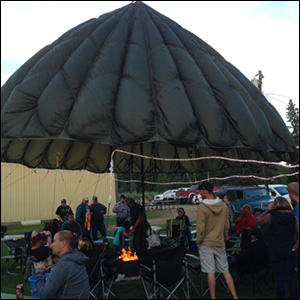 Our 35 foot USGI Parachute makes a great canopy to protect you from the sun (pictured right). Another great item that will keep you protected from the sun in style is our selection of Boonie Hats. This hat will keep you cool with built in grommet vents and the brim is more than adequate to keep the sun out of your eyes. Choose from a number of camo patterns and colors and stay out of the sun in style! Tables have a million uses at a tailgate, and our USGI Folding Table at just $69.95 is a great option come game-time. This solid wooden black top with olive drab legs boasts built in straps to keep the table securely folded during transport, which comes in very handy. Whether it’s to hold food and drinks, a portable television or stereo, make an impromptu beer pong table, or something in between, this table makes a terrific addition to any tailgater’s arsenal. This table is in used condition, but for tailgating that should be seen as an advantage. It’s no secret that your tailgating gear is going to take a beating no matter how cautious you are, so you might as well get an awesome deal on this used table which still has many, many years of use ahead of it. Built to tough military specs, these tables will outlast just about any commercial table. Now that you’ve got all this awesome gear, you need a great way to transport it to the game! The GI Hardigg® Waterproof container with totes is the REAL DEAL. This is a great transport case with a ton of uses outside of tailgating, but it’s great for that, too. The totes inside this case make it easy to keep your tailgating supplies neat and tidy, and make crossing off your tailgate checklist before you leave the house a breeze. Hardigg® products are so rugged and well-built that we just had to recommend a few more! The Hardigg® Hard Plastic Waterproof Storage Chest with Wheels and the Hardigg® Waterproof Container with Drawers make exceptional additions to any tailgater’s gear. Another great item for transporting your tailgating gear on a budget is heavy duty Dutch Military Transport Bag. We hope you find some of these items of interest as you get ready for tailgating season! If you’ve found any of our items to be of use to your tailgating activities we’d love to hear about it. Reach out to us on our Facebook page and let us know about your favorite items!